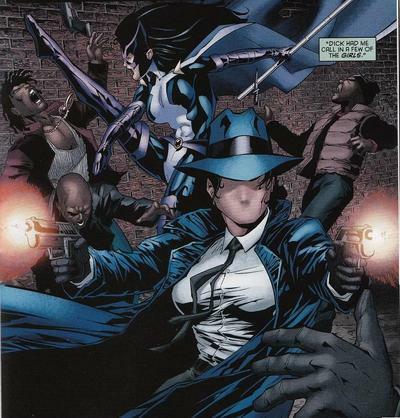 Renee Montoya is a police officer born to immigrants from the Dominican Republic. She eventually works her way up to homicide detective and partnered with Harvey Bullock. After Bullock is promoted to Lieutenant, Montoya is partnered with Crispus Allen. After the earthquake that destroys Gotham and sets up the “No Man’s Land” war, Montoya, along with Bullock, is one of many officers that remain in the quarantined Gotham to help James Gordon keep the peace. During these events, Montoya eventually reaches out to Two-Face and is able to connect with his Harvey Dent persona. Harvey helps Montoya and the Gotham City PD with relief efforts but also falls in love with Montoya. Two-Face still shows his true colors, however, when he keeps Montoya in his headquarters against her will. This eventually works to everyone’s benefit, however, when the villain puts Gordon on trial. Montoya is able to convince Two-Face to give Gordon a defense attorney, which Harvey takes the role of, with Dent eventually convincing himself to let everyone go free. Once Gotham City is returned to its normal state, Montoya resumes her normal police duties. Still in a twisted form of love with her, Two-Face believes the only way he can have her is to take everything away from her. To that end, he outs her as a lesbian to the public before framing her for murder and then kidnapping her, to make it appear that she is trying to escape justice. Eventually, with the help of Batman, Montoya is able to free herself from Two-Face and clear her name of the charges. However, the damage is done as her parents disown her for having a “evil” lifestyle. Montoya and her partner Crispus Allen are ambused by the Black Spider with Allen having to shoot the villain. The crime scene investigator, Jim Corrigan, steals the bullet and sells it on the internet. However, the bullet is crucial evidence that proves Allen’s self-defense claim. Montoya is enraged by this and beats the name of the buyer out of Corrigan, clearing Allen’s name. This is not enough for Renee, however, and she becomes obsessed with outing Corrigan as a corrupt individual. Allen tries to convince her to let it go to no avail and so he begins investigating Corrigan on his own. This leads to Allen’s murder at Corrigan’s hands, which only further spurs Montoya on to bring Corrigan to justice. Renee goes as far as beating Corrigan’s girlfriend into unconsciousness before pulling a gun on Corrigan. Jim pleads for his life and Montoya cannot bring herself to pull the trigger. Disgusted with the whole situation, Renee quites the GCPD the next day. Months later, Montoya descends into alcoholism. She spends all her days in bars and her nights obsessing about the loss of her career and girlfriend. The Question shines a modified bat-signal, that creates a question mark, at her window to recruit her. The Question believes Intergang is preparing to invade Gotham and hires Montoya to stake out a warehouse where the pair uncover numerous futuristic weapons. They then track further leads on Intergang back to Kahndaq where they are taken prisoner by members of Black Adam’s army. The Question is eventually killed and Montoya is left his mask, carrying on the mission to save Gotham from Intergang. She eventually finds herself teamed up with Nightwing and the pair find a strange device that Nightwing worries is a bomb. The device is activated and erupts in a pillar of flame as other devices go off across the city, revealing Intergang’s scheme to burn Gotham City to the ground. Montoya puts on the mask and battles Intergang as the Question for the first time. Nightwing and Question succeed in stopping Intergang’s plan. After becoming the second Question, Montoya goes on to occasionally aid the Huntress and Birds of Prey, though she resists joining the team in any official capacity. She also pursues the Crime Bible and is able to resist the attempts of its cult like followers to convert her to their cause. She also investigates the Dark Side Club during Final Crisis. Montoya also comes into conflict with Frankenstein and the agents of S.H.A.D.E. during her pursuit of Libra, now in possession of the Crime Bible, and Darkseid. She is also confronted by the Spectre, possessing the spirit of her former partner Crispus Allen, who is only stopped by the intervention of Radiant, the Spirit of Mercy. Montoya is confronted by Maggie Sawyer and Batwoman, both under the thrall of the Anti-Life Equation. However, the Spectre and Radiant intervene and teleport her away. For some unknown reason, Renee also seems to be immune to the effects of the Anti-Life Equation. Because of this, Renee is recruited by Checkmate to travel the Multiverse and gather help for New Earth in repelling Darkseid and Anti-Life. Renee returns with Captain Marvel and a group of alternate Supermans that are able to end the threat. During the Blackest Night, Lady Shiva attempts to test Renee’s fighting ability out of respect to the former Question, Victor. The two begin a vicious fist fight until Victor, now a Black Lantern, attacks them. The three fight until Renee realizes that Black Lanterns feed off of emotion. Using meditation, she cuts herself off from her feelings and becomes invisible to the Black Lantern Question. Angered, Vic leaves in search of easier prey. Left alone, Shiva reveals that she didn’t want to fight Renee but was setting a trap for the Black Lantern. She and the Huntress also eventually discover a human trafficking ring run by Vandal Savage and manage to end it, at the cost of Renee taking the Mark of Cain from Vandal (given to Savage by the Spectre). Renee seeks out Richard Dragon, who helps her learn how to suppress the effects of the Mark of Cain. She then joins the newly formed Batman Inc. and helps shut down the violent cult known as Golden Portal in France.